Two weeks ago, Tenzin Delek Rinpoche, a renowned 65-year-old Buddhist teacher, became the latest in a long line of Tibetans to die in Chinese prison, sparking international outrage and protests against China. An educator, a spiritual teacher, an environmentalist, and an indefatigable advocate of Tibetan welfare, he was exactly the kind of Tibetan that China can't stand. Thirteen years ago, Chinese authorities sentenced Rinpoche and his nephew Lobsang Dhondup to death on trumped up charges of "terrorism and separatism." Rinpoche was given a two-year reprieve while Lobsang Dhondup was executed on January 26, 2003. The blatant injustice galvanized thousands of people to campaign for Rinpoche's life. Hundreds of Tibetan exiles, whose parents had fled their homeland after China's 1949 invasion, were drawn into a life of activism. I was a new staff member of Students for a Free Tibet, one of several Tibet groups that organized marches, rallies, petition drives, and direct actions to publicize Rinpoche's case. His name became a recurring theme in our conversations. His iconic picture, stenciled on our t-shirts and pasted on our laptops, became a living breathing presence in our lives. Few people have done more for Tibet than Tenzin Delek Rinpoche. Born in Lithang, an eastern Tibetan region famous for its fine horses and fearless warriors, Tenzin Delek started off as an unknown lama of humble origins. But through extensive social and humanitarian work, he established scores of clinics, schools and orphanages. He built nunneries to educate women, and nursing homes for the elderly. He settled long-simmering disputes between families. Criminals who couldn't be tamed by multiple stints in prison were miraculously subdued and reformed by Rinpoche. His profound impact on the community didn't stop there. 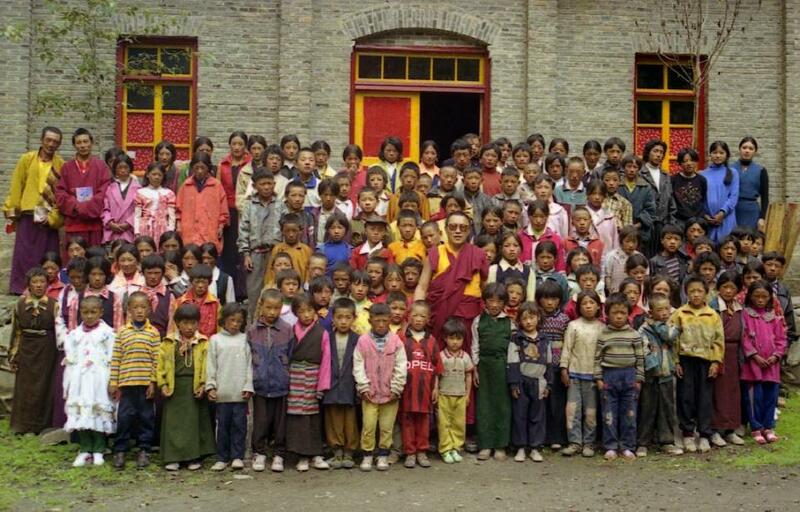 He fought against China's rampant deforestation in Tibet, and the alarming rate of desertification. He battled mining companies - and sometimes succeeded in keeping them out of the region. This angered local Chinese officials, who were often in collusion with the extractive industries. Predictably, the authorities tried to arrest him in 1997 by connecting him to pro-independence leaflets. Rinpoche fled to the mountains. The local communities, staging risky protests, persuaded the authorities to leave Rinpoche alone. When he returned to the village in 1998, thousands of villagers gave him a hero's welcome. (Tenzin Delek Rinpoche flanked by orphans at a school in Nyagqu County. Photo: Tsering Woeser via AP). However, he was now a marked man. In 2002, Chinese authorities arrested him and sentenced him to death for the false charge of "bombing." Rinpoche was put to a sham trial whose foregone conclusion was to lock him up. Following a sustained global campaign to save his life, his sentence was commuted to life imprisonment. As a result of harsh prison conditions, Rinpoche's health quickly deteriorated - for Tibetan political prisoners, torture and beatings are routine and well documented. Despite repeated appeals by his family and public expressions of concern from world leaders, China denied him medical care. Though we knew Rinpoche was ill, his death shocked us all the same. But what China did afterward took their cruelty to yet another level. For Tibetan Buddhists, if there is one thing more important than life, it is the moment immediately following one's death, when the Tibetan Book of the Dead is read out loud to guide the dead person's soul toward spiritual liberation. In this period, one's consciousness passes through what Buddhists call the "clear light moment," an opportunity to propel one's consciousness into higher rebirth, even enlightenment. Rinpoche was denied this opportunity, as his body lay in a high-security prison for days. Even as thousands of Tibetans demanded the return of his body to give him the traditional Buddhist final rites, a right provided by the Chinese constitution, the prison authorities illegally withheld his body. In an unforgivable act of insult against a whole nation and religion, the prison guards secretly cremated Rinpoche's body. Last week, when his relatives were carrying Rinpoche's ashes to his hometown, Chinese police stopped them and forcibly seized the ashes. They then effectively abducted Rinpoche's sister Dolkar Lhamo and her daughter, both of whom are still missing. In life, they robbed him of his freedom. In death, they robbed him of his liberation. But there was one thing they could never take away from Rinpoche: his dignity. He died undefeated. Thanks to this brand of Tibetan dignity - and a stubborn hope against all odds - even after sixty years of colonial occupation, Tibet remains unconquered. Tibetans continue to see the exile government in Dharamsala, not Beijing, as their true representative. Since 2009, roughly 150 Tibetans have self-immolated to protest Chinese rule. Rinpoche's death, tragic as it was, will initiate yet another generation of Tibetans into the freedom struggle. Instead of merely praising Tibetan pacifism, world leaders must turn up the heat on China. Using economic leverage, political pressure, and social activism, the world must support the Tibetan people's nonviolent struggle to end Chinese rule and establish a free and democratic Tibet.